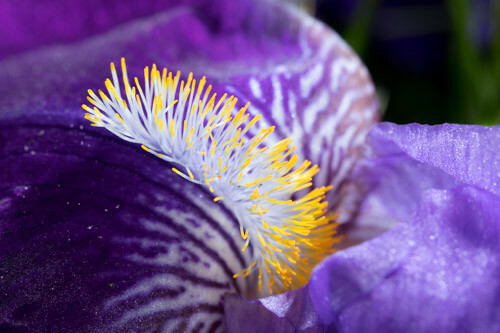 The bright yellow and white "beard" of this Bearded Iris stands out in bold contrast to the deep purple and blue petals. I took this picture a couple days ago when a good friend of mine came over to visit & see if we could enjoy some macro photography around the yard with his new camera. It had been a while since we had the chance to catch up with each other, so we had a nice walk & talk. The day came with a good stiff wind, so we didn't get much macro work in. Still, I found this iris laying down low to the ground, which kept it from jumping around as much as everything else! The bold colors caught my eye and this wind-tossed little iris offered me some nice images.